Add some elegant class and style to your home with this traditional settee. Perfect for relaxing in the living room, temporary seating in the foyer, or a nice addition to the bedroom, this piece can enhance any room. This settee is built for comfort and to impress with its thin flare tapered arms, slightly curved back with tufting, welted trim, and long wood legs. This piece is also constructed with kiln-dried hardwoods, ensuring a strong and sturdy foundation that is built to last. Available in a wide variety of fabrics, the possibilities are endless with this traditional settee. 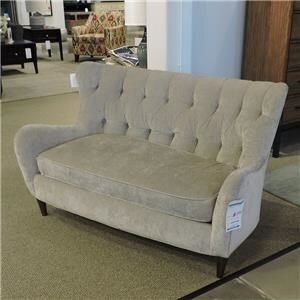 The Houlihan Traditional Settee with Tufted Back by Sam Moore at Belfort Furniture in the Washington DC, Northern Virginia, Maryland and Fairfax VA area. Product availability may vary. Contact us for the most current availability on this product.